Oregon rancher militia standoff on public lands: FAQ. What in Tarnation Is Going on With All These Angry Ranchers? 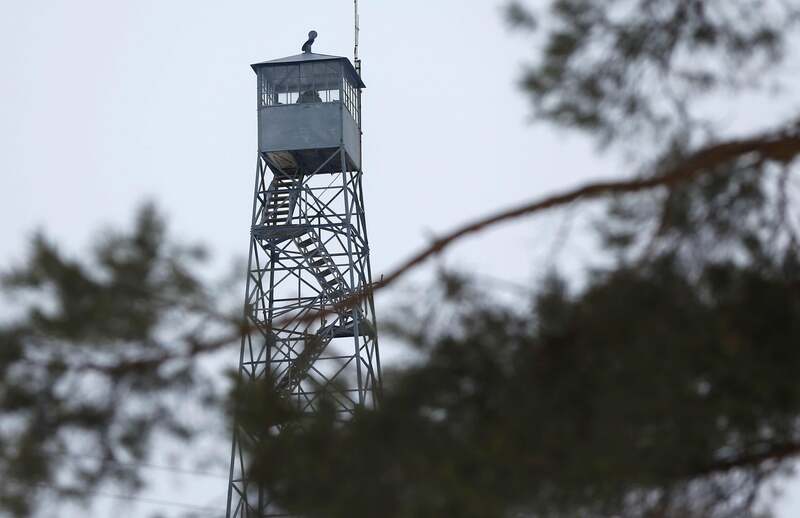 A watch tower manned by militia members who have taken over buildings at the Malheur National Wildlife Refuge near Burns, Oregon on Jan. 3, 2016. What in tarnation is going on out there in the West? The immediate answer to that question is that a group of armed protesters—which many observers are referring to as a militia, though the group hasn’t declared itself as such—has occupied multiple structures on the federal Malheur Wildlife Refuge near Burns, Oregon. No federal officials were present when the armed group moved in, and at this point no one has been hurt. Authorities are monitoring the situation but have not made any effort to evict the armed occupiers. There’s no official count of how many protesters are involved; representatives of the group itself claim there are up to 100 people on refuge property currently, but a High Country News photographer counted no more than 20. What are these guys upset about? The armed group split off from a larger nearby protest related to the imprisonment of Dwight Hammond and his son Steve Hammond, two area ranchers who were convicted in 2012 of committing arson on federal property in 2001 and 2006 and have been ordered to return to jail by an appellate judge. The Hammond family has a long history of legal disputes with the government related to public property near its land; an article in High Country News from 1994 said Dwight Hammond had made death threats against Malheur Refuge officials on four occasions. The case has become a cause célèbre for “patriot” groups and taken on a life of its own—the armed group at the Malheur Refuge does not appear to have links to the local community, and a representative of the Hammonds has said they do not endorse the militants. And is this related to the other rancher standoff last year in Nevada? Yes. Last year agents of the Bureau of Land Management became involved in an armed standoff with supporters of Nevada rancher Cliven Bundy over Bundy’s refusal to pay fees for his cattle to graze on public land. BLM agents halted a seizure of Bundy’s cattle when confronted by his armed supporters; even before the standoff Bundy’s land had become a gathering point for anti-government “patriot” extremists. At least two of Bundy’s sons, Ammon and Ryan, are now at the Malheur Refuge, and Ammon Bundy is talking nonsense about how the occupiers are going to be there for years (!) as the “point of the spear” for an uprising against public-land-related government oppression. What is “public land” in this context? Like, national parks? Sort of. As this helpful post on the Wildlife News blog explains, the U.S. government has long owned a massive amount of land in the West (land which it claimed by force from Native Americans, bought from people who had claimed it by force from Native Americans, and, in a meta twist, claimed by force from people who had claimed it by force from Native Americans). Some of this land has been given or sold to private owners; some has been used for national parks, national forests, and wildlife refuges; some is plain old so-called “public land,” land which lacks a tourist or ecological designation and is administered by the Bureau of Land Management. The BLM has about 10,000 employees and manages some 250 million acres. What about this is so upsetting to the ranchers? Has any of this rhetoric led to actual violence against government officials? The anti-federal-government conspiracy-theorist movement in general is a very dangerous one, but the good news is that the narrow issue of land use doesn’t seem to have been linked to any killings. A far-right-wing conspiracy nut in Arizona was convicted in 2013 of firing a rifle at two BLM rangers, but, fortunately, he missed. In general, though, as this High Country News piece documents, government employees who deal with conservation and land use are still routinely the targets of disturbing harrassment and threats of violence. A group called Public Employees for Environmental Responsibility says it has documented 439 threats of violence against BLM officials since 1995. Is there any lighter side to any of this? For example, did a man being cited in Silverton, Colorado in July 2012 for not registering his all-terrain vehicle grab a BLM agent’s groin and shout, “let me touch your wiener”? According to one of the items in the High Country News article about threats against land officials, yes, that happened.